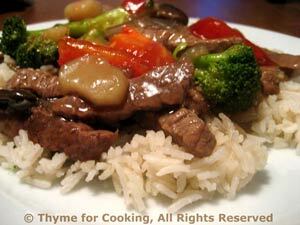 Beef and Broccoli, Stir-Fried, quick healthy dinners, Thyme for Cooking. Flank steak lends itself very well to stir-frying, but a lot of markets are selling packages of pre-cut meat just for this purpose - take advantage of someone else's work if you can! You can arrange the rice on a platter, spoon the beef and broccoli on top and serve, or use separate bowls. Mix 1 tbs sesame oil with 1 tsp soy sauce. Toss with beef and set aside to marinate. Mince garlic, ginger (peel first) if using fresh. Open, drain and slice water chestnuts. Cut the broccoli into bite-size pieces, try to keep a bit of floret and stalk on each piece. Cut the tomato into 8 wedges. Heat olive oil in large nonstick skillet over medium-high heat. Add onion and celery to skillet and stir-fry for 2 minutes. Add water chestnuts, garlic and ginger and stir-fry another 2 minutes. Add beef to skillet and stir-fry 3 - 5 minutes, until brown. Add broccoli to skillet and stir-fry 3 - 5 minutes. Add tomato and stir-fry 1 - 2 minute longer. Add beef stock and sherry to skillet. Return beef, onions, celery, etc. to pan. Stir to combine. Heat to boiling, cover, reduce heat and simmer for 2 minutes.